Jonathan Alter and Bob Braun went man-to-man a few weeks ago in the pages of NJ Monthly over the subject of education reform. From my perspective, Braun cleaned Alter's clock, and I said so on Twitter. The sad fact is Alter got many things wrong in his piece, but that's understandable: the conventional wisdom he traffics in is largely a fact-free zone when it comes to education (and what else, I wonder...). Alter: "Despite shockingly high per-pupil expenditures, the schools were mostly horrible, with pathetic graduation rates and students offered almost no chance to escape from poverty." What exactly do you mean, Jon, by "shockingly high"? 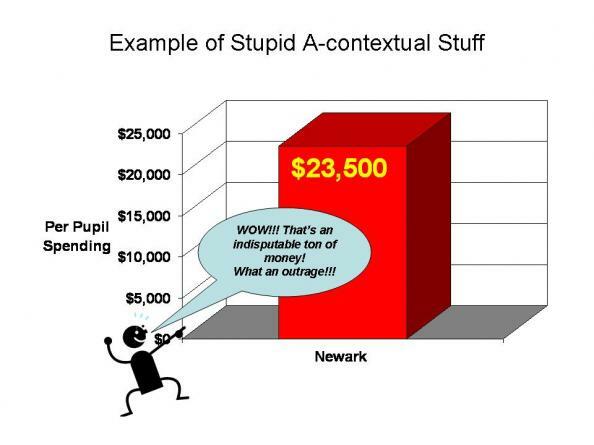 As Bruce Baker has explained ad nauseum, claiming that education costs are "shockingly high" is an a-contextual claim that is devoid of meaning. If you want to argue that New Jersey spends relatively larger amounts of money than most other states on schools, that's fine -- we do. But we also get a lot for it: our overall metrics of educational success lead the nation, and we have seen substantial and sustained progress from students who are in economic disadvantage or who are part of traditionally disenfranchised racial groups. It would be stupid on its face. Alter: "All the talk of “corporatizing” schools is baloney." How is it possible to be a journalist and yet remain so credulous? And then last question, Ron, any comments on the new state pipeline, particularly now after the elections. You sounded relatively optimistic. I'm wondering if anything is looking more likely over the next 6 to 12 months. Well, yes, as you know, I tried -- tend not to talk about prospective states but I will say just the following of the results of the elections in several of the states were very favorable for K12 with regard to potentially opening a new school and in other cases, increasing the enrollment cap. So we were actually quite pleased with the results in several of the states on Tuesday night. It continually amazes me that pundits like Alter and Tom Moran can be so willing to think the worst of teachers unions' motivations, yet they remain absolutely convinced that Wall Street is backing reforminess simply out of the goodness of their wealthy little hearts. I mean, how much more brazen do you want these people to be? It's a sign of how far American journalism has fallen that Alter appears to be not even the slightest bit bothered by any of this. I'd post another bunch of links (here, here, here, here, here, here, here, here, here, here, and here), but what would be the point? If you're not ready to listen, all the facts in the world don't much matter. Alter: "If you don’t believe me, visit Newark charter public schools like North Star Academy or TEAM Academy, where the student population is almost all non-white and the waiting lists are long. There is magic in their classrooms. With more than three-quarters of their students in grades three through eight scoring “advanced” or “proficient” on yearly assessments, they not only outperform neighboring traditional public schools by more than 30 points, they beat white suburban schools." 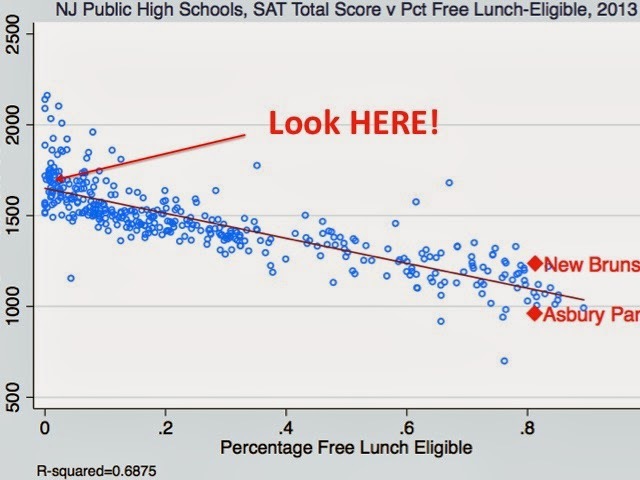 Here are all New Jersey schools' Grade 8 NJASK scores on English Language Arts for 2013, plotted against the proportion of students enrolled in each school who qualify for free lunch. Look at how closely all the dots follow the line: nearly three-quarters of the variation in these schools' test scores can be statistically explained by how many students at the school are in economic disadvantage. 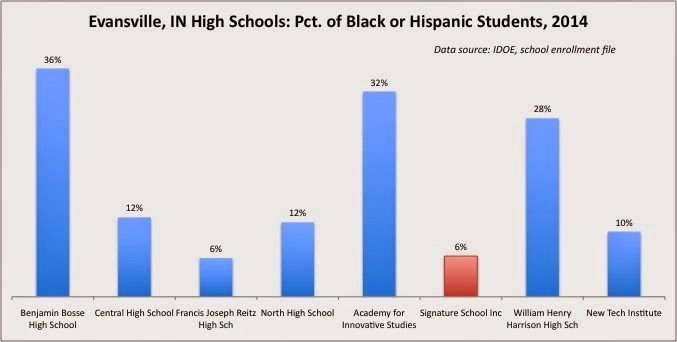 Yes, there are charters that "beat the odds." North Star & TEAM are both above the trend line, beating prediction -- good for them. But there are also loads of public schools who do as well, if not better. We further know that the few special education students these schools serve have the least expensive and intense disabilities, and that these charters serve far fewer children who speak English as a second language. There is no "magic" at North Star or TEAM. They may serve the students who stay on their rolls well, but it's absurd to paint them in such fawning terms. In fact, members of the TEAM staff, well aware that they do not serve they same students as NPS, have confessed to me that they are becoming increasingly embarrassed at the gushing of pundits like you who refuse to acknowledge obvious differences in student population characteristics. Alter: "More than 90 percent of North Star and TEAM students graduate and go to four-year colleges (including Princeton, MIT and Penn), compared to district-wide graduation rates of under 30 percent." Jon, when you can come up with an explanation that squares North Star's huge attrition rate for black boys with its graduation rates, I'll be ready to listen (to be fair: TEAM's graduation rate lines up much more realistically with its attrition rate). Jon, if pundits like you spent half as much time pointing out the failure of Chris Christie to adequately fund our schools as you do beating up teachers unions, maybe people would demand change. Alter: "Rock-solid tenure and last-in-first-out layoff policies backed by teachers unions? Bad for kids, because it makes it nearly impossible to fire bad teachers and forces the layoff of good young ones while weak teachers with seniority stay on." Tenure also protects good teachers like Mike Mignone from the witch hunts that are currently taking place within Newark. And the myth of the burned out senior teacher who isn't as effective as the good young one is simply that: a myth. There is no evidence neophytes outperform veterans in the classroom -- quite the contrary. Why do you spend so much time, Jon, writing about mythical burned out teachers protected by tenure when you could write about actual teachers who were saved by it? Alter: "Charters are also public schools and thus by definition cannot be draining resources." By any reasonable definition, charters are not public schools, because they are not state actors. But if you don't believe me, ask the Ninth Circuit Court of Appeals, the Census Bureau, and the National Labor Relations Board. Alter: "According to an authoritative Stanford University study, New Jersey charter public schools performed significantly better than traditional public schools." That's simply not true. The NJ CREDO study matched students through a "virtual" matching process (a highly suspect one); it did not match schools. So while the study did find "matched" charter students did better than their public school counterparts, it did not find matched charter schools performed better. This is a critical difference that your neighbor Moran just doesn't get: you can't compare Newark charters to NPS schools, because there are no NPS schools that serve so few students in economic disadvantage, who have special needs, or who don't speak English at home. 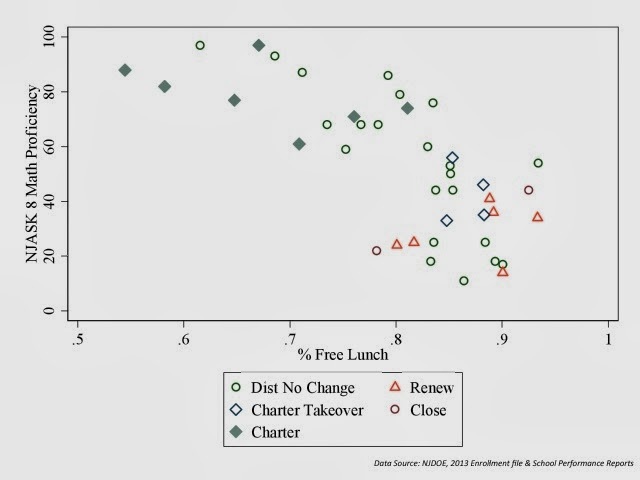 Peer effect is real and it is a large part of the success of the Newark charter sector; logically, however, it is impossible for all schools to have a free lunch population that's lower than average. 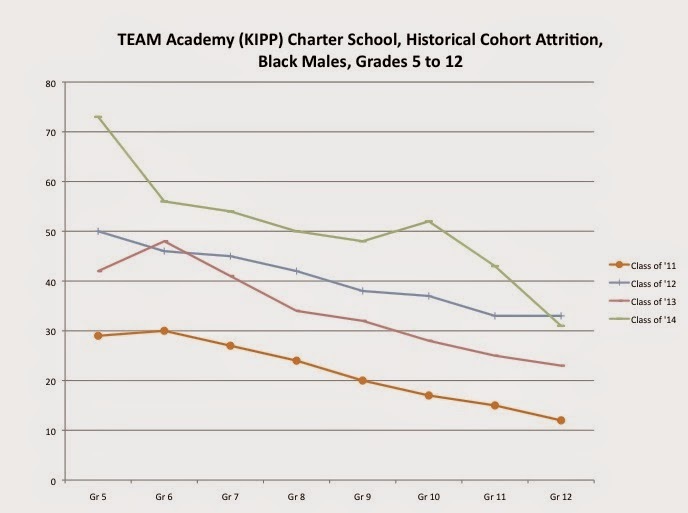 Alter: "Charter students are almost entirely poor, black and Latino. It is ridiculous to claim they are hurting the population they are serving." 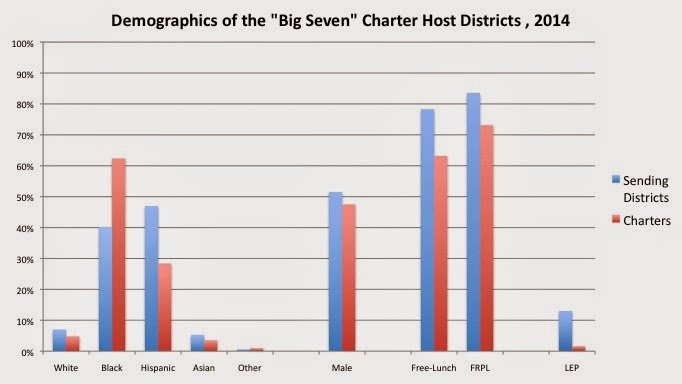 The "Big 7" are the seven largest charter-feeding districts, responsible for over three-quarters of the charter population: Newark, Jersey City, Paterson, Camden, Trenton, Plainfield, and Hoboken. These charters serve a racially different profile than their sending districts, fewer children in economic disadvantage, and far fewer Limited English Proficient (LEP) children. New Jersey's charter schools are turning back the clock on the integration of special needs students with the general education population. But don't feel bad Jon: aside from me and scant few others, no one ever talks about this. Alter: "Principals in New Jersey and across the country are eager to hire TFA teachers, who mostly remain in education after their two-year commitment." The phrase "mostly in education" is a slick way of avoiding the truth: more than 80 percent of TFA's corps members leave their assignments after three years (which makes the program ineffective and expensive for school districts). "Stay in education" does not mean stay teaching in schools with significant levels of student poverty; increasingly, the phrase means find a job away from those kids in the burgeoning education-industrial complex. Alter: "In most New Jersey districts, the total number of assessments hasn’t changed, though the tests are getting harder, which upsets defenders of mediocrity." Completely false. Under your other neighbor, Chris Cerf, New Jersey has moved toward a testing regime that will be unnecessarily onerous for high school students. The PARCC has already forced districts to spend large sums of money upgrading their technology, not for curricular uses, but for testing. This unfunded mandate has already earned the scorn of our state's school leaders. And we don't know if the tests are measuring more complex skills; all we know is that, once again, politicians are monkeying with the passing rates. Jon, you've got a choice: continue down this path, like your reformy neighbors, or read people like me and the others on my blogroll to the left and learn a little something. When you're ready to pull your head out of the sand, let me know -- contrary to my prose, I am a surprisingly likable guy. Not a good position for a journalist. Alter: "Contrary to popular assumption, charter schools generally offer lots of art and music, subjects that are critical." 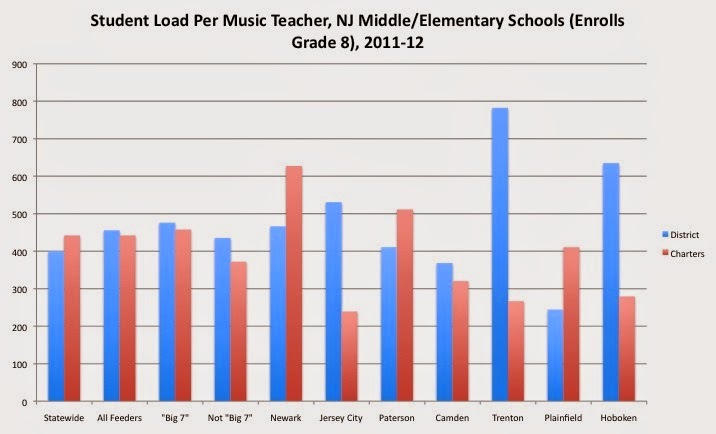 One of the ways you could measure the commitment of a school/district to the arts and physical education is to look at the "student load" for teachers of these subjects. If your specials teachers work in schools where they are responsible for more students, they are taking on a larger student load; that art or music or PE teacher is responsible for more kids, and is spread further, possibly impeding their effectiveness. 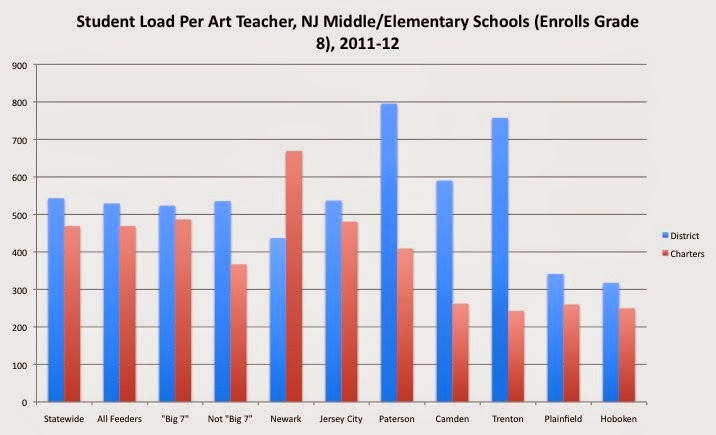 Throughout the state, district elementary/middle art teachers have greater student loads than charter art teachers, with the exception of Newark, where TEAM and North Star reside. The last year for which I have staffing data (that I trust) is 2011-12; in that file, TEAM is listed with only one PE teacher, 2 art teachers, and no music teachers. North Star had one art teacher, two theater/stage teachers, 3 PE teachers, and two music teachers. North Star enrolled 1687 students in 2011-12; TEAM had 1504.5. I'll certainly entertain the possibility the files I have from NJDOE are not complete; absent that, however, we're left with some doubts about Alter's claims. One art teacher for nearly 1700 kids doesn't inspire confidence. No music teachers is even worse. And one Health/PE teacher for over 1500 kids? No one can believe that's adequate. This data is a few years old; let's hope things have improved. I had a little Twitter exchange with Ryan Hill of TEAM Academy Charter School, the Newark branch of the national charter chain KIPP, last week. He and I seem to see the issue of student attrition differently. >So when, for example, TEAM's Class of 2014 started Grade 5 back in 2006 with 196 students, and later began their senior year with only 115 students, that's an attrition rate of 41 percent (we can argue about how exactly to present it, but the enrollments remain the same). That same class, by the way, started Grade 9 with 148 students. So it's not like all of the students transferred out after Grade 8 into other high schools; losing 22 percent of your class during high school is significant. Hill, in our exchanges, doesn't see it that way. He claims TEAM "backfills": they take students in as others leave. OK... but that doesn't explain why the overall cohort -- the "class" -- shrinks as they move from grade to grade, does it? The class/cohort keeps getting smaller; that's "attrition." To whatever extent there is backfill, there would have to be even more students leaving TEAM than the decrease in the cohort from grade to grade. Certainly, TEAM does't have nearly the cohort attrition of North Star. 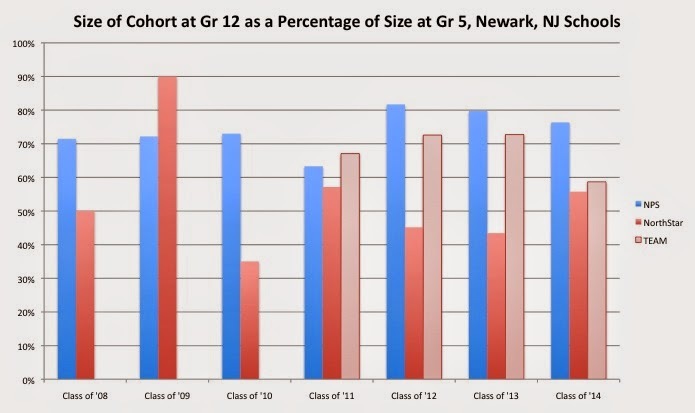 In the last three years, however, TEAM has seen its cohorts shrink more than the Newark Public Schools when judging the size of a class/cohort at Grade 12 to its size at Grade 5. Considering how charter cheerleaders like Tom Moran and Jon Alter laud the successes of charter schools while bashing the graduation rates of NPS schools, this is a point that needs to be addressed. Certainly, we don't know exactly how this attrition is related to graduation rates -- we'd need student-level data for that. 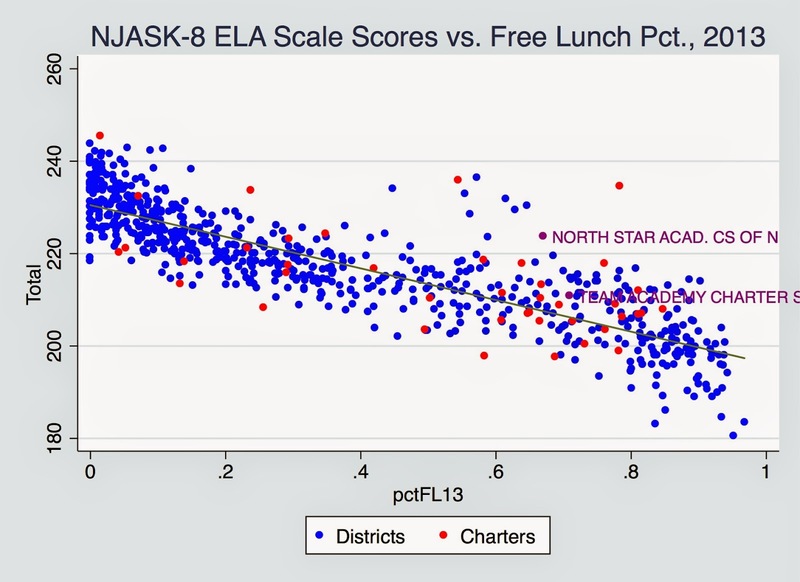 But these patterns do tell us that TEAM (and North Star, even more so) students do leave in significant numbers, and that ought to at least give us pause before suggesting these charters have found a replicable formula on a large scale. And we should be concerned when the attrition rate is especially pronounced for black males. This is the percentage of students who both entered and left during the school year. The calculation is derived from the sum of students entering and leaving after the October enrollment count divided by the total enrollment. This is the percentage of students who both entered and left during the school year. In other words, we're not looking at how a class/cohort shrinks in size over time; we're looking at the number of students in all cohorts moving into or out of a school between October 15 (when schools do their official enrollment counts) and the end of the year. Further, we don't know how many students of those 7.4 percent are leaving TEAM, and how many are coming in. It's conceivable that all of these students are leaving; we just don't know. In any case, Hill's graph doesn't address the central issue in cohort attrition: the classes/cohorts get smaller each year for charters at a rate that is faster than the aggregate for the district schools. The majority of the transfers at TEAM could be (and likely are) taking place during the summer; kids stick it out at TEAM until the end of the year, knowing that they'll be in another school (or even no school) by the next fall. Which, of course, begs the question: what sort of kids are leaving the TEAM? Are they a cross section in terms of demographics and academic ability? Or does TEAM gain an advantage from shedding the kids that move on? We don't know; only student-level data would tell us. But we can reach one conclusion: it will be very difficult to replicate TEAM's model on a large scale if the inevitable result is patterns of cohort attrition larger than the district's. Mid-year student mobility may be a metric worth considering, but it is not student attrition. 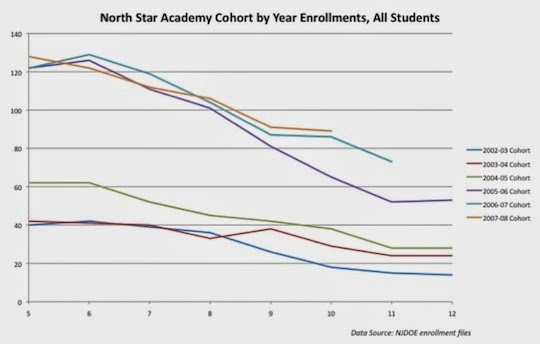 And while TEAM's reported graduation rates are closer in line to their cohort attrition rates, North Star's are not. You can't have a serious talk about ramping up charter proliferation without addressing these basic facts. Ryan Hill seems like a decent guy, and I'm happy to have a good-faith discussion with him. But let's not conflate our data, shall we? 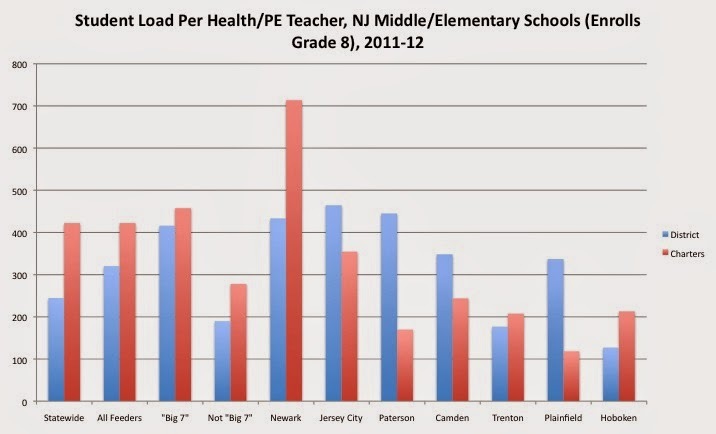 The issue on the table is the shrinking size of classes/cohorts in Newark -- not mobility. 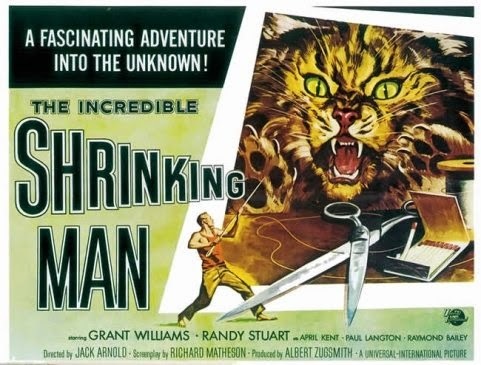 Move all you want -- you're still shrinking. It’s not a stretch to say that charter schools are some of the biggest winners in this year’s high school rankings list. Even though charters educate just five percent of American students, they represent 30 percent of the top ten schools in this year’s rankings. What’s more—and this is really the kicker—they’re the only ones in the top ten that do not use selective admissions. That is, BASIS Scottsdale, BASIS Oro Valley, and Signature School are the only schools in the top ten who don’t choose their students. They’re open-enrollment schools: anyone can come, and if there are too many applicants for the available seats, they determine the student body by lottery. Nonetheless, they’re still competitive with the hyper-selective private and magnet schools rounding out the rest of the top ten. What’s going on? What makes charter schools different—and how does it contribute to their success? I taught at a charter school in Brooklyn some years ago, and my principal would frequently call out three types of flexibility that made our school successful: 1) hiring (and firing), 2) schedule, 3) and curricula. That’s about it. According to the National Center for Education Statistics, there were 24,544 secondary public schools in the United States as of 2011, and another 6,137 combined elementary/secondary schools. This survey got responses from around four percent of those schools. On this basis alone, The Daily Beasts's rankings aren't worth the hard drive space they're stored on. But we'll set that aside as we usually do and address Conor P. Williams's contention that "BASIS Scottsdale, BASIS Oro Valley, and Signature School are the only schools in the top ten who don’t choose their students." Is it true? U.S. News & World Report loves to rank everything. It sells. Their most recent ranking of high schools shows two Arizona charter schools in the top ten in the nation: BASIS Tucson (#2) and BASIS Scottsdale (#5). As always, the back story is more interesting than the numbers. The BASIS charter schools – about a dozen of them, mostly in Arizona but a couple outside, like in San Antonio – are the brainchild of Michael and Olga Block. Michael is a former free-market economist from the University of Arizona. BASIS schools have made their reputation by ruthless screening of all applicants to insure that no special needs or English language learners make the cut and repeated testing until the wheat is separated from the chaff. BASIS Tucson advertises itself thus: "BASIS Tucson uses an accelerated curriculum that includes Advanced Placement courses in subjects ranging from calculus to music theory." The great irony with BASIS Scottsdale is that the Blocks first chose to create it as a private schools with tuition in the $20,000 a year range, but when only 7 students had signed up they quickly converted to a charter school to collect the guaranteed $6,000 a year from the state – quite a failure out there in the free market. As a charter school, BASIS Scottsdale has attracted a student body that is 40% Asian. Heh -- well, you're a better blogger than I am, Gene! Glass has looked at BASIS several times, and the answer is always the same: these "winners" serve small student populations, and they have high levels of cohort attrition. 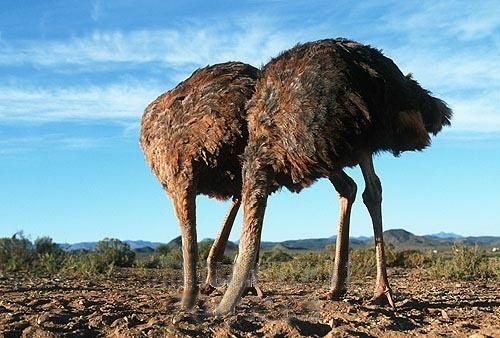 In this, they are not alone: as a guest poster at Diane Ravitch's blog recent pointed out, cohort attrition is a phenomenon that defines "successful" charters in New York, Chicago, Denver, New Jersey, Texas, Tennessee, San Francisco, and, yes, Arizona, home base of the BASIS chain. And - surprise! - it turns out Indiana's Signature School is also hip to the game. From the IDOE data portal, Compass. Look at the Class of '14: started with 115 in Grade 9, ended with 77 in Grade 12, which means about one-third of the students transferred out. Things are only a bit better for the class of '13, and it looks like the Class of '15 will follow suit. Yet the school keeps claiming a 100% graduation rate. Compared to the surrounding public schools of Evansville, Indiana, Signature only serves a small number of children who are in economic disadvantage. And the racial profile of its student body is quite different from most of the other surrounding high schools. As always, here's my standard caveat when discussing these schools: in the absence of any other evidence, I am happy to concede that Signature, BASIS, and any other charter school serves its particular students who remain enrolled in the schools well. It is possible that there are personnel, scheduling, and curriculum innovations that contribute to the "success" of these schools. And, of course, the students and staff should be proud of their accomplishments. But Williams's charter cheerleading here is, at best, incomplete. And The Daily Beast really should step up its game if it wants to be considered a serious news organization (quite an assumption on my part, I know). Even if this is an op-ed piece, you shouldn't allow work this sloppy on your website: at the very least, Williams ought to have been made to acknowledge the very basic and easily verifiable facts Glass and I have outlined. But this has become standard operating procedure in Reformyland: unabashed love for the "market" trumps any worries about pesky, uncooperative data. Of course, I'm so old, I remember when "liberals" used to make fun of the wing-nut right for their faith-based policy initiatives. In my last post, I questioned the idea of the senior, burned-out teacher being a major policy concern, simply on the basis of the fact that there really aren't that many senior teachers to begin with. But what does the literature say about relative teacher effectiveness late in a career? What do we know about teachers who enter the late stages of their professions, and their effect on student outcomes? 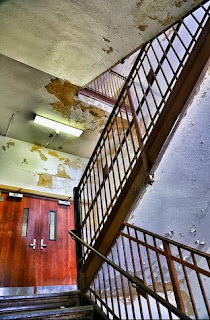 Is there a body of evidence that supports the contention that we need to clear out a lot of dead wood in our schools? The short answer is: no, not really. - Parents Across America has a short list of studies showing positive gains in student achievement correlating to teacher experience long through a teacher's career. Among them is a study of Project STAR data from Tennessee by Raj Chetty and John Friedman (yes, those guys), which found positive correlations in Kindergarten between teacher experience (up to 20 years) and test scores. Hmmm... "declined beyond that" doesn't sound good -- until you get to p. 227, where you find that teachers "peak" at their 24th year of grade-level experience, and teachers at their 40th (!) year still outperform their third year colleagues. - In a brief from CALDER, Jennifer King Rice brings together data from several studies to show a mixed bag of results for senior teachers. In lower-poverty schools, teachers with 28 or more years of experience perform near or above their colleagues who have at least three years of experience (p. 5). 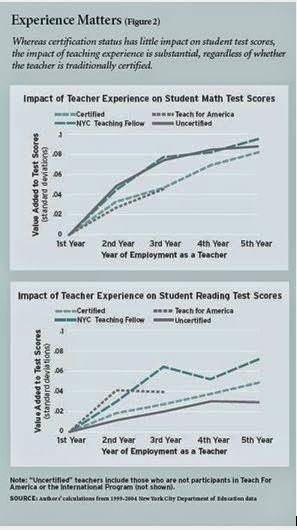 The senior teachers significantly outperform the Year 3-5 teachers in reading gains; math is much closer. 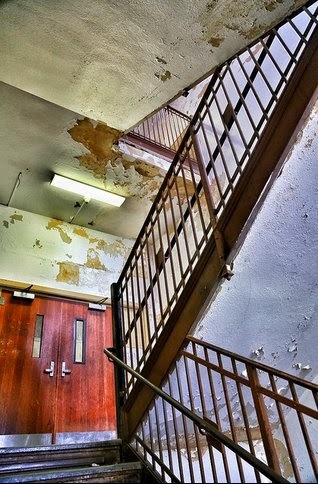 Higher-poverty schools show vacillating effectiveness depending on the bin for experience, making it difficult to draw any definitive conclusions about senior burn-out. - Rice cites Boyd et al, who show no appreciable decline in elementary and middle-school math teacher effectiveness (in New York City) between teachers with 6 to 10 years of experience and teachers with more than 20 years of experience. - Helen Ladd gave a presentation, based on North Carolina data, where the effectiveness of elementary teachers dips slightly after the 27th year (slide 5), but still outpaces those with less than 12 years of experience. High school teachers with more than 27 years are outperformed by all other experience groups, but the difference with novice teachers is quite small (0.007 SD) and, again, I'm left to wonder if non-random assignment to courses, combined with those courses' alignments with End Of Course tests, is an issue. - Chingos and Peterson also look at some Florida data. Their "two-stage" model has quite a number of caveats attached to it, but it is the only one appropriate to looking at teacher effectiveness past 20 years. Most of their figures on pages 36 and 37 do show a slight decrease in value-added scores after around the 27th year (the Grade 6-8 reading figure is a real anomaly). But there's no evidence (save that middle school reading figure, which is so different from the others) that novice teachers are any better than senior teachers; quite the contrary in the elementary years. So what are we to make of this? Well, TNTP implies that there's some evidence that senior teachers do burn out. I'd say, however, that evidence is, at best, mixed, and not even close to the evidence we have that teachers gain most in effectiveness within their first few years (even TNTP concedes that point). 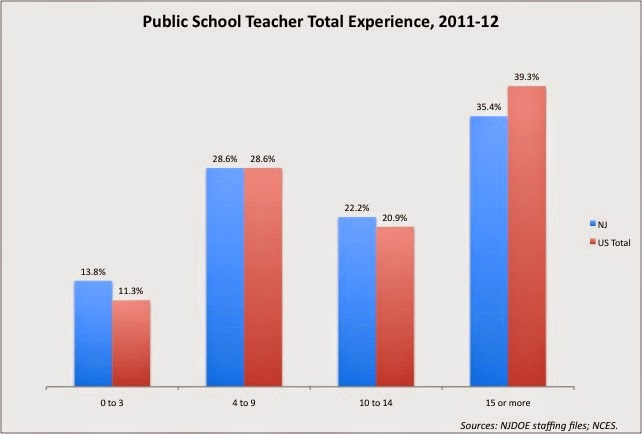 Further, there's no body of evidence that novice teachers consistently beat out senior teachers. Yes, it's possible that teachers late in their careers do not get the test score gains they may have earlier -- but any idea that replacing senior teachers with novice teachers should be a major policy thrust is simply not borne out by the facts we now have. Further: all of this evidence, mixed as it is, is based on a very limited subset of the entire curriculum and types of teaching positions. And it's all based on standardized tests. And the practical effect sizes are quite small. One thought I had when reviewing all this was that senior teachers may be more inclined, at the late stages of their careers, to look at test score gains as less meaningful for them or their students. Maybe senior teachers feel they have the freedom to focus on things they find more important to their students' educations than test scores gains. I have been teaching middle-school math for 20 years. I feel like a veteran of a war. Almost like the veteran sergeant in an old war movie who is still standing after numerous campaigns and is there to greet the new group of raw recruits. I have seen administrators come and go. I have seen curriculum ideas come and go. I have seen all manner of policies come and go. I have taught students who were considered unteachable. 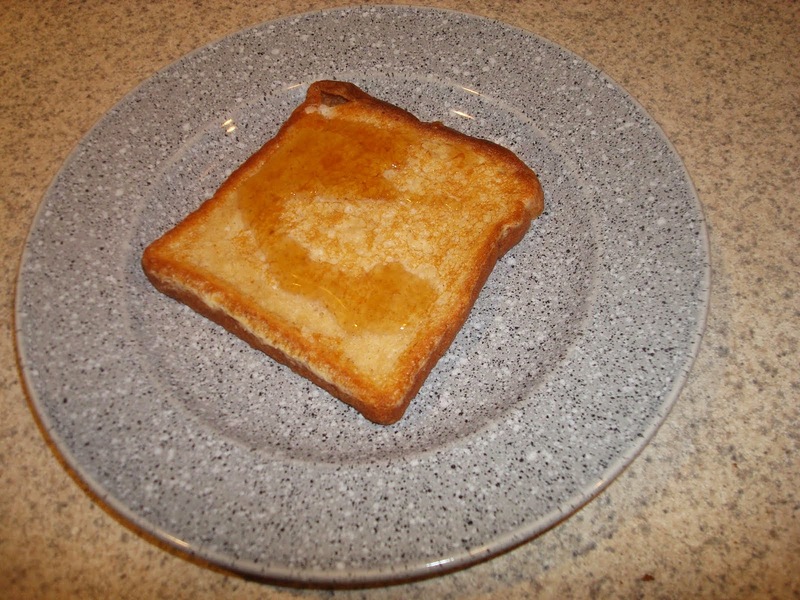 That being said, I feel that I am at the top of my game this year. In an effort to align my instruction with the Common Core State Standards, I am incorporating Singapore Math into my daily lessons so that students who have poor number sense can become better math students. We don’t have a textbook – I am using my years of experience and knowledge to pull material together that I feel will best serve my students. I use daily assessment to guide my teaching. I share data/test results as feedback with my students when they take yet another standardized test. I have control of my classroom and can cover the material I need to cover in the 50 minutes allotted without spending half of the time doing crowd control. There are lots of new teachers who are great to work with. They have a lot to offer and their input is appreciated and applauded. But there are new teachers coming in who believe that just because I am old enough to be their mother in some cases, I have no value. I am more than ready to listen to their ideas. If they are good ones that I feel will benefit the students – great. But if I don’t greet their idea with pomp and fanfare (because we’ve already tried it with little success), it doesn’t mean I’m burned out. Amen. Senior teachers should be looked at sources of wisdom and history, just like in every other profession. Yes, undoubtedly some do burn out -- just as in every other profession. That doesn't mean, as reformy pundits too often suggest, that clearing out veterans to make way for novices is a reasonable strategy for improving student outcomes: we just don't have the evidence to support that policy. A pressing education policy concern? Not hardly. Non-teacher Jonathan Alter is also gravely concerned that all of these bad, doddering senior teachers are taking jobs from awesome younger teachers when layoffs come (no word from Alter on what he thinks about those layoffs themselves, especially in light of the news that we've gone backwards in how much we spend in per pupil on education). Non-teacher David Bernstein is sure that the problem must be those rotten pensions teachers get. In his construction, pensions provide incentives for washed-up old farts to stay in the classroom, even when they clearly hate their jobs. Bernstein's argument is a traditional piece of pension-bashing logic, premised on the notion that there are large numbers of old, exhausted teachers who would love to ditch their jobs, but only stay because of artificial pressures and protections. Is there any evidence that America is awash in poorly-performing senior teachers? Let's answer that question by first looking at the composition of the teaching corps. This chart is from staffing data I've used before from the NJ Department of Education, compared with data from the National Center for Education Statistics. NJ tracks fairly well with national numbers, so we'll be able to look my home state in more depth in a minute and get a more refined view that likely reflects the nation as a whole. But let's take a moment to see what we've got with these national numbers. Around 40 percent of teachers have 15 or more years of total experience; a solid majority of teachers have less than 15 years of experience. On this basis alone, we ought to question the notion that scads of burned-out senior teachers are a critical policy concern: if we take 15 years to be the cut point, it turns out most working teachers aren't even that senior to begin with. Granted, 40 percent is still a good number -- but 15 years is hardly a lifetime of working. So how do teachers break down in experience when we look at it with finer precision? 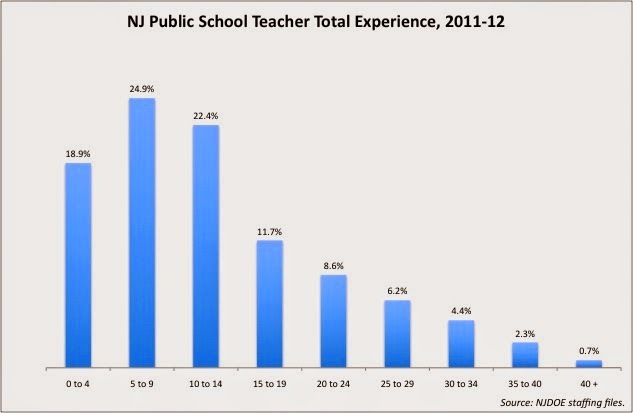 Less than 8 percent of the teaching force has 30 years or more of experience. I ask again: even if we assume there are high rates of burn-out -- an assumption for which we have little to no evidence -- why would we think ineffective senior teachers were such a serious problem? There just aren't enough senior teachers in the profession to justify all the concern about their relative effectiveness. No one debates this: teachers gain most in effectiveness in their first few years of teaching. Of course, we need new teachers, and if they can only improve through actual experience, that's a price that must be paid. But I'd think reformers would be far more concerned with doing whatever it takes to make sure younger teachers are better prepared to lead their own classrooms, rather than focusing on the small number of senior teachers who may or may not be ineffective. This is a matter of priorities: we can worry about the 15 to 20 percent of inexperienced teachers we know are less effective, or we can concentrate on the less than 10 percent of senior teachers we think might be less effective. Which brings me to the next part of this: what evidence is there that teachers lose their effectiveness late in their careers? And do we have any evidence that pensions or other incentives cause burned-out teachers to stay in the profession past their due date? A critical education policy issue? Buy and read José Luis Vilson's This Is Not a Test. 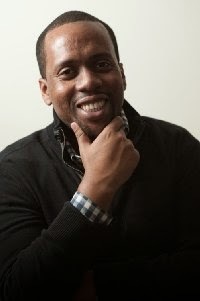 @TheJLV is one of the better known teacher-bloggers around, and a prodigious tweeter. He asks hard questions and gives little quarter when it comes to issues of race and education (although I've noticed he also has greater patience with those who are willing to engage in a sincere, respectful dialog). That's why so many of us feel like we're getting less than what we give. Deteriorating working conditions make it harder for teachers to stay in the classroom; those of us who do work harder just to make up for the deficit. We give more and more, but it often feels like we get less respect, less funding, less attention, less of a stake in the way schools should run. This may or may not have been caused by the CCSS [Common Core State Standards], but one thing is clear: the standards are but a symptom of a system that devalues the input of the people it affects. I'm a bit reluctant to put that quote out here first, because you might come away with the impression that this book is yet another whine about how teachers are being set upon by forces from on high. Vilson certainly is an advocate for his profession, and he has little time for those who seek to impose an agenda that doesn't have the evidence to back it up. But if Vilson has a primary thesis, it's to be found in the quote above: the "teacher voice" is sorely lacking in our conversations today about education and its role in the perpetual problems of race and class that dog our society. As teachers, we see the effects. When our students arrive at school malnourished and uncared for, they're treated like vagabonds. They act out, stealing from each other and screaming at their teachers. Teachers and administrators scrutinize them for every possible disorder or dysfunction; while such kids can benefit from more substantial help than any individual can offer, many of them don't really have a disorder at all. They just need someone to talk to them like human beings. Yet, if they are not being misdiagnosed for some disability, they confront an instant bias against them in the classroom. Some people who decide to teach for all the wrong reasons will let their classism and racism creep through, stoking distrust among students toward an educational system they need. We can't blame hip-hop for social inequity, war, infant mortality rates, the rising cost of attending university, racism, or high incarceration and unemployment rates. This is what our kids carry in their backpacks every morning at least 180 days out of the year. It's because Vilson has such respect for teachers that he demands so much from them. As a music educator, I was particularly struck by the story of his high school choir teacher, Ms. Kittany, who "unlocked a voice that I didn't know I had." His elegy for Elana Waldman, a colleague who continues teaching while battling with and eventually succumbing to cancer, is full of admiration (tempered with candor). And he's humble enough about his own teaching to acknowledge just how hard the job is; what he won't do is use that as an excuse for educators not to engage in meaningful self-reflection. The people in my class may act like they hate me temporarily after I've scolded them about something, but they know I have their best interest at heart. Many teachers of color have seen firsthand what might happen if their children don't get a good teacher. I have tried on this blog to be a strong advocate for teachers. I really do believe we, as a group, are being blamed for a whole host of problems we didn't create and cannot be possibly expected to fix on our own. I have seen firsthand how tenure and other workplace protections have kept good people in the profession, and I've seen how innumerate and illogical teacher evaluation systems have pushed good educators out. But I have to admit that this point of view is somewhat limited, because it runs the risk of viewing teachers as a homogenized mass, and of viewing the effects of teachers as being similar for all students. Reading Vilson, it becomes clear that this isn't the case. One of my favorite talking points -- one echoed by many people who share my inclinations -- is that 10% to 15% of the variation in test scores can be traced back to teacher effects (it may be even less). I stand by this and I think it's critical to understand how this fact impacts test-based teacher evaluation. But when I step away from a policy-centric way of thinking, I grow concerned that this fact is conveying the wrong message to those who aren't viewing education through my lens. I worry that I'm inadvertently making the case that teaching doesn't really matter and, therefore, teachers don't have to worry much about their practice. Obviously, I don't believe this; but the point is subtle and difficult to put across, and I fear I haven't done a very good job at it. I'm not saying people from other cultures can't help us, but every student of color could use a role model. If their role model happens to be a teacher in front of them, that's perfect. We have high expectations for the children sitting in front of us because we were once them. We can tell the difference between a kid not knowing how to add fractions and not knowing how to say the word "fraction," because many of us were once English language learners. We don't take "Yo, what up, teacher?" or "Hey, miss!" to be a sign of illiteracy, but a sign that they want to connect with us as human beings. Our importance as teachers of color stems from this dire need for kids of all races and backgrounds to see people as multidimensional and intelligent people, different in culture but the same in capability and humanity. José is making a case many have made, including myself: in a world where we have more students of color, we need more teachers of color (and it wouldn't hurt to have more out here in the white, leafy 'burbs as well -- but that's another discussion). I stand by the premise that removing tenure and instituting more test-based evaluation and imposing more unproven mandates and keeping teacher pay low and setting up merit pay and selling the Common Core like it's a miracle cure and creating chaos through school closures and all these other reformy policies will do more to drive away bright, young people of color from the profession. But Vilson's book forces me to acknowledge something more: teachers matter, and there's a good case to be made that they matter more to students whose communities have been historically disenfranchised. Which means that we all have to raise our game -- because you can't ask Vilson and his colleagues to teach as if it's a matter of life and death without asking me and my colleagues in the 'burbs to do the same. But we in the affluent public school districts have to do something else: we have got to start standing up for our fellow teachers, no matter where they teach. I am very fortunate to work in a well-resourced school with children who (mostly) don't suffer from the effects of economic disadvantage and racism. I know that small class sizes and a good physical plant and technology used appropriately and a curriculum that values creativity and critical thinking are the necessary preconditions for a great education. That makes it more incumbent on me and teachers in my position to point out how utterly, shamefully wrong it is to allow the disgusting and dangerous conditions found in urban and poor rural districts to continue. And we must insist that the pedagogy of compliance found in "no excuses" urban schools should become as much of an anathema there as it would be in our suburban schools. Further: it's important that we acknowledge the mission José and others have taken on as teachers of color and do all we can to support it. We need to listen to their voices and learn from their experiences, and take that back to our own classrooms, fully realizing that a socially-aware pedagogy only works if it is taught to everyone. José and I are very different teacher-writers. I am a numbers and policy guy. I happen to think I'm quite good at it: I'll dissect your reformy argument like nobody's business. I'll drown you in statistics and charts and linear regressions. I'll read your bill or your brief or your paper a dozen times and then put up a hundred links to show you're not reaching the right conclusions. I'll deconstruct your ridiculous editorial, and as soon as you write another, I'll do it again. I obviously enjoy doing this kind of work, and I think it's important. But it's not expressing a "teacher voice." What I do here could be done by anyone, in or out of the classroom. I do think one of the reasons I do it fairly well is because being a teacher gives me an insight into how the education system actually works -- but that's not a "teacher voice." KOZOL (page 163): You have to go back to the schools themselves to find an answer to these questions. You have to sit down in the little chairs in first and second grade, or on the reading rugs with kindergarten kids, and listen to the things they actually say to one another and the dialogue between them and their teachers. You have to go down to the basement with the children when it’s time for lunch and to the playground with them, if they have a playground, when it’s time for recess, if they still have recess...You have to do what children do and breathe the air the children breathe. I don’t think there’s any other way to find out what the lives that children lead in school are really like. José Luis Vilson is doing something very brave and very necessary in This Is Not a Test: he is letting us breathe the air his students breathe. Again, because he's such a good writer, he's put us in his classroom and his schools' hallways; he's got us sitting in those "little chairs" (OK, not so little -- he teaches middle school). I don't do that; frankly, many teacher-bloggers don't do that. And maybe I should. I am very sympathetic to the argument that students' privacy must be protected at all costs. In my case, my students are even younger than José's, so I'm inclined to err even further on the side of caution. I'll probably never simply blog about my classroom because I'd want another pair of eyes on my writing first, just to make sure I was protecting my students. Books are a much better medium for this sort of storytelling if only because they are created through a social process that allows more time for reflection and editing. That said: we don't have enough teachers telling the stories of their classrooms, and our debate about education suffers for it. Vilson is providing a valuable service here, and more teachers -- yes, including yours truly -- need to think about how we can inform the public about the everyday life of our classrooms. The public needs to see Ruben Redman and Eduardo and JJ -- some of the students with whom Vilson has us "breath the air" -- as more than points on a scatterplot. They need to see José's kids, my kids, your kids, as human beings: struggling, laughing, getting into trouble, soaring. Only the "teacher voice" can bring this to an American conversation about education that is sorely needs it. Can those of us doing the job every day find it in ourselves to unlock this voice? Can we all be José Luis Vilson? I really didn't think I'd be interviewing Joe Del Grosso yesterday. When I reached out to my contacts in the Newark Teachers Union, I was looking for a response from them regarding the news, first reported by the estimable Bob Braun, that a Newark parent group, PULSE, was pushing a federal investigation of the state-run school district's restructuring plan, One Newark. As I wrote in a series of briefs with Bruce Baker this past year, One Newark is a racially biased plan -- and that bias includes racially disparate impacts on teachers of color. If PULSE was setting up a lawsuit over the effects of One Newark, and, as Bob reported in another story, the feds are investigating charges of racial bias against administrators, where is the NTU? Are they involved with these lawsuits and investigations, and are they planing any of their own? So I asked the folks I know at NTU if they had any comment. They, in turn, said I should speak to Del Grosso, the president of the union since 1995. But as we talked about the lawsuits, one thing led to another, and we wound up having a wide-ranging conversation about Newark, State Superintendent Cami Anderson, Governor Chris Christie, and several other topics. In fairness to Del Grosso, I'm going to report our conversation without comment in this post; later, perhaps, I'll add my own opinions. I first asked Joe Del Grosso if he supported the PULSE lawsuit: "Oh, absolutely." According to Del Grosso, NTU is partnering with the Abbott Leadership Institute and other organizations, including parent groups, to help bring legal actions. But why doesn't NTU act on their own? "Because Chris Christie would love it," answered Del Grosso. "He'd see himself as following in the steps of Ronald Reagan, breaking unions. I'm sure he's making that calculation as we speak." It's clear that Del Grosso is concerned that Newark's teachers could easily become pawns in Christie's plans to run for president. But does that mean the union can't act? What about striking? "If we went on strike it would cost this union between $100,000 and $200,000 a day. Christie would decertify us and fire all of our members. And even if I called a strike, we'd only have maybe eleven people out on the lines anyway." "Our members want to fight this battle, but they understand the consequences. They don't want to strike when it's illegal. Other strategies have to be employed. We've got to disrupt the market and find alternative ways to win." Would that include trying to get a legal injunction against One Newark before school starts in the fall? "The courts aren't going to do anything by September," replies Del Grosso. "But we're meeting with parents and other community groups." So why not publicize some plans now? "When you go to war, you don't put your battle plan out in public,"says Del Grosso. "We have to work quietly now because we are in a war of occupation: the state is occupying Newark." Del Grosso is well aware of dissent within his own union, but he has little patience for his critics who call for more radical actions: "What they know about unionism wouldn't fit in a thimble." That said, it's apparent Del Grosso and NTU are going to have to fight for their members within the structure of the tenure system. I asked if he felt any of his members had been unfairly dismissed under One Newark. "Of course," he replied. NTU, according to Del Grosso, has 62 tenure cases pending; while not all are directly tied to One Newark, the majority are related, or were brought by principals the district has since fired. "Many of these are trumped up tenure charges: teachers with twenty or twenty-five years of excellent service who suddenly are judged ineffective. Our members are tired of being policed by someone who only taught for two weeks themselves. It's blatant disrespect." Which brings up the subject of Anderson. Del Grosso's disdain hasn't diminished; if anything, he has even less respect for the district's leadership than he did before. Even Beverly Hall, the former Newark superintendent now under indictment for fostering widespread cheating in Atlanta (Del Grosso is on the witness list for that case), garners more of the NTU president's respect than Anderson. "Beverley Hall was a lot smarter and more qualified than Cami Anderson. She lacks the knowledge or the ability to be able to know when enough's enough. I've never met anyone as shallow or who has such a lack of understanding of public education. Because of that, she doesn't have the ability to understand when someone is offering her a good deal." "Not only are Newarkers being robbed of educational opportunity; not only are Newarkers being robbed of their right to vote. But New Jersey's taxpayers are being robbed of $100 million." "Christie says he's a real conservative. But what could be more 'Big Government' than the state takeover of a local school district?" "We've had Bridge-gate; we should now be looking at School-gate." And that, it seems, is the calculus Del Grosso will continue to make for at least the near term: everything in Newark hinges on Chris Christie and his political ambitions. "Let's hope his ego is so big that he believes he can be the president and winds up leaving the state." A final thought: I'm not an NTU member, but Del Grosso gave me a good bit of his time to have his say. I haven't always agreed with the tactics of NTU, but I really do appreciate that he was willing to speak with me. Joe Del Grosso, President, Newark Teachers Union.